Fountainhead are a specialist designer, fabricator and installer of incredible water features and fountains. This Wordpress site was a custom build based on Neil Holroyd's designs and the client's input. The Project and Concept pages use jQuery Isotope loading in post content via AJAX. 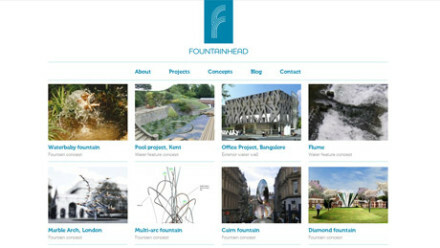 A WordPress site for Fountainhead – a London based company who design, fabricate and install amazing water features and fountains. Based on Pierce Film-Lid’s designs, with a lot of input from the client, the main thrust of the development from my point of view was the Project and Concept pages. Each page pulls in the content from a custom post type and lays out in a grid format. When the user clicks on the image, the Isotope reLayout method is called, and an AJAX function resizes the containing element and animates the content in. It’s not that easy to do this kind of work, which is why you don’t see it too much. Very rewarding when you get it all working though! The other technical point on this job is that there is an email input field for downloading the product brochure. When the user enters their email they are sent a download link. You could of course just add a download link to the page, but then you don’t generate a database of contact names with download statistics.